CasinoBonusNews → Casinos → "Casino.com review"
Casino.com bills itself as the only place to play, and although there are certainly other online casinos on the Internet, Casino.com is one of the few sites that could be considered a total package. 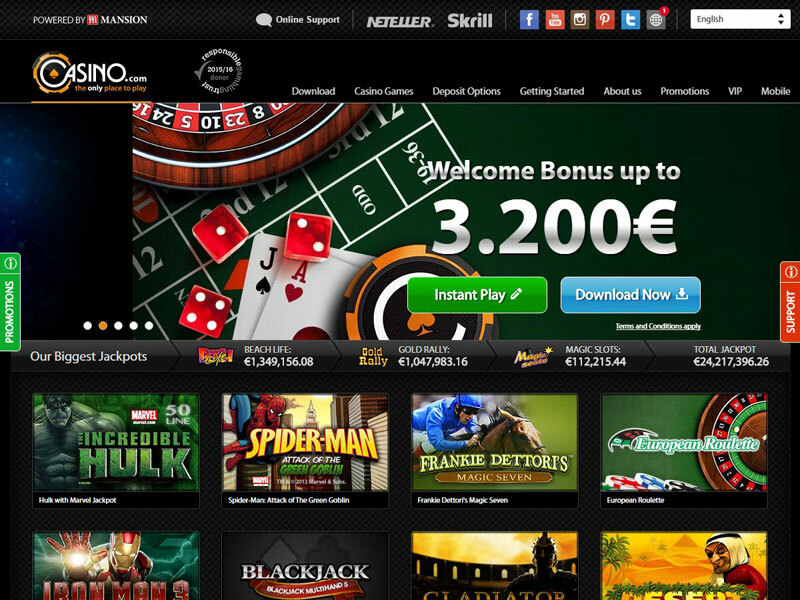 The casino is run on the well-tested and highly popular Playtech software platform. This means it has the instant play online version that can be accessed by either Mac or PC computers through Flash. It can also be played through the free download software that is only for PCs but contains the full version of the casino with all the games. Casino.com is keeping up with the latest technology by providing its customers with a live dealer version of some of the most popular table games and a mobile casino that is accessible through mobile devices like iPhones, iPads and Androids. Plus, it states up front on its Web site that its software has been audited by Technical Systems Testing for having a truly random number generator. 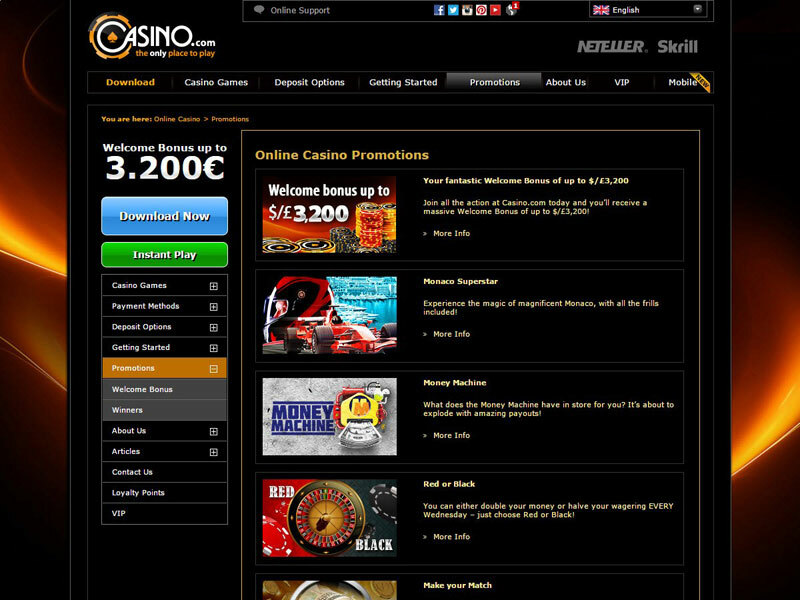 Along with its commitment to software and information security, Casino.com dedicates itself to keeping gambling fun by not becoming an addiction by providing links to sites that assist addicts and their families. This online casino likes to pile on the promotions to keep gamblers in the mood. Among its current list of bonuses is the welcome bonus that can potentially give players up to $3,200 over the course of eight deposits. The first eight deposits can earn up to $400 each on deposit made up to $400 through a100 percent matching bonus. Deposits must be made once a week, the playthrough amount for being able to cash out winnings is 40 times the deposit plus the bonus, the money can only be played on approved games like the video slot machines and the bonus money disappears from the account if a player doesn’t check into the account at least once every 30 days. Players have the ability to opt out of the welcome bonus during their first deposit, but they cannot decide later to redeem it during any future deposits. After cashing in – or cashing out – the welcome bonus, players have a list of other promotions to choose from. Casino.com runs seasonal holiday bonuses, reload bonuses, matching bonuses and cash back bonuses that come and go. These can change monthly or even weekly, so it never hurts to keep checking in to the real money account and keeping ahead of what promotions are current. In addition, the casino runs a VIP rewards program that gives players casino points for every $15 they bet at certain games. These points accumulate, until the player can cash them in for chips that can be used in the casino. Casino.com gamblers can even earn $50 for each friend they recruit to the casino who makes a real money deposit themselves. To make a money deposit, each player will go to the cashier tab within their account and will be presented with a list of banking options based on where they live. These options run the range from those available to everyone, like Skrill, NETeller, credit cards or debit cards to ones that may only be available for people living in certain countries like Przelewy24, Sofort, GiroPay or iDeal. To withdraw winnings, players must provide the casino with a copy of a photo I.D., a copy of his or her credit card and proof of the current address. This may seem excessive, but it is to ensure that the player gets his or her money back securely instead of handing out someone’s money to random strangers. Funds are returned to the player then in one of several ways: NETeller, WebMoney, MoneyBookers, Click2Pay, wire transfer, ClickandBuy, InstaDebit or check. What can a player do once the money is in the account? Play at each of the hundreds of games, of course. Numerous video slot machines line the casino’s counters, like Gladiator or the Incredible Hulk. Gamblers can choose from several versions of roulette and blackjack, find a casino poker game to bet on, try their luck at the lotto scratch cards, play a hand or a hundred at the video poker games or take part in a craps game. If the player is looking for live dealer table games, Casino.com hosts real-life webcam games on blackjack, roulette, baccarat and casino hold’em tables. Some slot machines and table games include progressive jackpots, and the grand total of these games can climb into the millions quickly. The Casino.com Web site keeps track of the current jackpot numbers along with some of the biggest recent winners and the latest casino promotions. Casino.com may be one of hundreds of online virtual casinos, but it is one in a million when it comes to caring about the customer.